Contur cabinets provide the storage you need and the function you require wrapped in the sleek European design that you desire for your home and garage. Manufactured in Montreal, Canada, Contur cabinets are the perfect marriage of quality, form and function. You get a better-looking, more functional, modular cabinet system at an affordable price. This highly-flexible system boasts a timeless design. Yet, it’s loaded with innovative engineering features not previously available in this class of cabinet systems. Contur draws its name from the elegant, contoured front panels that are signature to the line. Contur’s patent-pending Replacement Front Panel System make the front panels (and cabinet colour) interchangeable. The expanded foam core in each front door panel minimizes the probability of inadvertent dents. Contur cabinets are easy to use, even when you’ve got your hands full. EZ-open finger pulls and spring-assisted door stays make it a breeze to lift or close upper cabinet doors. 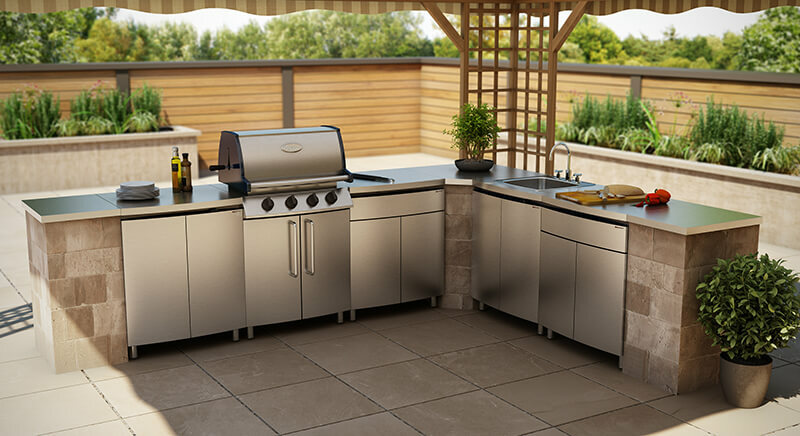 The push-to-open/close feature makes lower, swing-out doors easily accessible, even when you don’t have a free hand. Of course, sometimes you don’t want the contents of your cabinets to be easily accessible. Contur has you covered there, too. Most cabinet doors and drawers are lockable. The unique, tamper-resistant lock requires a specially-designed Contur key. Contur cabinets are also built tough. Drawers and shelves are sturdy enough to store heavy items. Upper cabinets include a full-depth, 50-lb. rated load capacity shelf that can be raised or lowered for optimal shelf height. Lower cabinets include a full-depth 100 lb. rated load capacity shelf. Drawer slides also have 100 lb. rated load capacity. The all-welded construction of Contur cabinets reinforces their strength. The result is a line of well-made cabinets that can easily be configured to fit your lifestyle and personal taste. Contur’s European-inspired, modular storage cabinets are available in several designs and configurations. The upper wall cabinets come in a variety of sizes and have swing-up doors which provide maximum view of interior cabinet space. For even more functionality, add the optional under mount lighting which provides optimal lighting for project work. What if you require space to store oversized items? Contur has double and triple storage cabinets that provide up to 37.5 cu. ft. of storage space; perfect for stashing away oversized items. 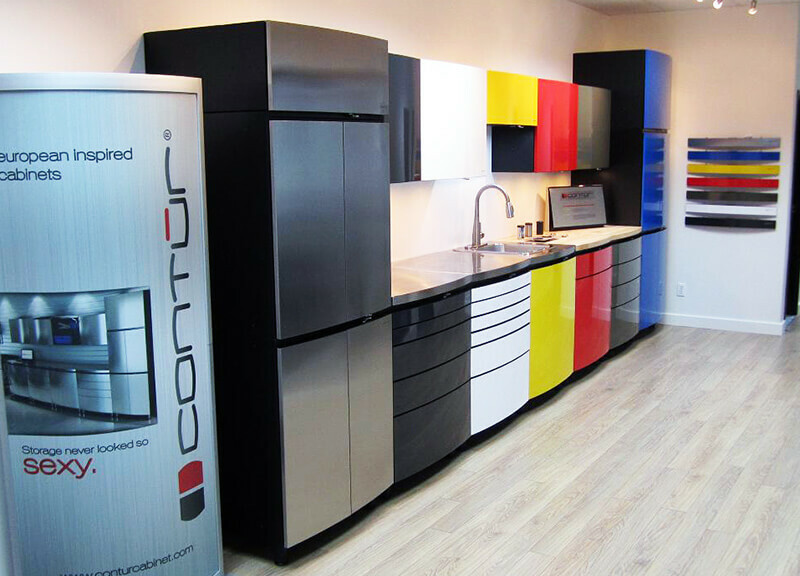 Contur cabinets come in a range of colours so that your finished design will reflect your personal style. The panel doors are available in Terra Grey or Alpine White to easily blend into your current design. Want to make a bold statement? 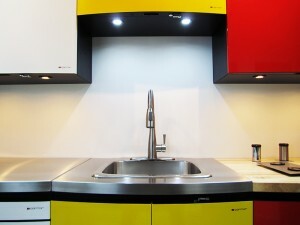 Choose panel doors in Santorini Blue, Cayenne Red, Karbon Black or Vespa Yellow. Looking for a sleek, modern feel? Opt for Contur’s head-turning, INOX Stainless Steel finish. Such a diverse product line affords impressive flexibility and allows for countless formations. So regardless of whether you need storage for laundry supplies, automotive accessories, gardening tools, seasonal items or household chemicals, Contur cabinets can easily be customized to fit your specific needs. 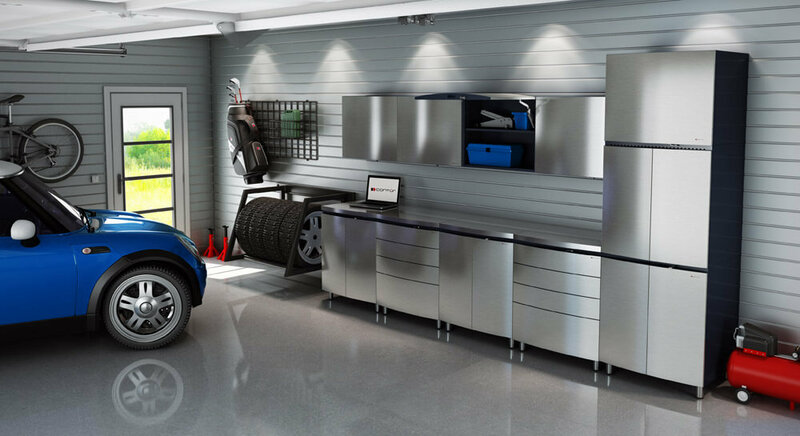 Contur’s line of sleek, highly-functional all-metal storage cabinets provide form, function and style backed by “The Contur Promise,” a limited lifetime warranty. 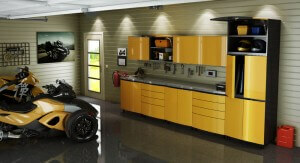 Want a preview of how Contur cabinets can help transform your garage and make you the envy of your neighbors? Request a consultation today.